Skip the Valentine’s Day Hype! Just Make Cherry Pie! Let me say this right up front. The Deerslayer household DOES NOT subscribe to the Hallmark-induced Valentine’s Day hype. There is nothing romantic or sweet about flowers, candy, jewelry, cards and restaurant menus that have suddenly, inexplicably doubled in price. Puzzling, yes. Romantic and sweet, no! Even grocers raise the price of steaks, seafood, sparkling wines. What the hell? I have no doubt that St. Valentine is spinning in his grave over this travesty. To honor St. Valentine and the spirit of the day, we will sear up some nilgai tenderloin, roast some asparagus, prepare a nice salad, and finish the evening off with some homemade cherry pie….. on February 16th! In my book, nothing says “I love you” like nilgai tenderloin done right, beautiful seared color on the outside, juicy and oh-so-pink on the inside. Also, Junior Deerslayer had been wanting to try her hand at baking a cherry pie. Since my New Year’s Resolutions included both branching out with my cooking AND never passing up a worthy dessert, honoring the request to try the pie was easy. Don’t get the wrong idea. We didn’t go outside to pick the cherries, nor did we render the fat necessary to produce the lard needed for the perfect crust. But I did purchase the (canned) cherries from our local grocer, refer to my NEW Lard Cookbook (yes, there is such a thing) for the perfect flaky-crust recipe, use some kettle-rendered leaf lard that I received as a birthday gift (really) and commence with the pie making! I ordered mine from Amazon but it’s available from a number of booksellers. I was able to find canned, tart cherries, packed in water. So that was our starting point. One of my intentions for 2016 has been to practice making flaky crusts from scratch for fruit pies, quiches, pot pies, empanadas and pasties (meat pies). 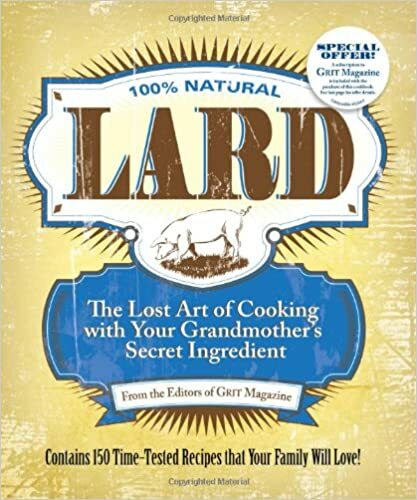 Hands down, people who know pies know that lard makes the flakiest crust. Leaf lard is the prized fat around the kidney area of an animal. I found some available online. I was surprised by how light it was and what a beautiful, smooth dough it made. For the crust, combine the flour and salt in a large bowl. Using a pastry blender, two butter knives, or your fingers, cut in the lard until the mixture is a very fine crumble. Sprinkle the cold water over the mixture and combine just until the mixture sticks together. Divide the dough in half. Form into 2 balls. Wrap each ball in plastic wrap and refrigerate for about 30 minutes. Prepare a work surface by sprinkling with flour, and roll out into two discs to fit your pie plate. For the filling, pour cherries in a medium saucepan and place over medium heat. Cover. After the cherries lose considerable juice, which may take a few minutes, remove from heat. In a small bowl, mix the sugar and cornstarch together. Pour this mixture into the hot cherries and mix well. Add zest and mix. Return the mixture to the stove and cook over low heat until thickened, stirring frequently. Remove from the heat and let cool. If the filling is too thick, add a little reserved water, too thin, add a little more cornstarch. Pour cooled cherry mixture into the crust. Dot with butter. Moisten edge of bottom crust. Place top crust on and flute the edge of the pie. Make a slit in the middle of the crust for steam to escape. Brush with egg. Sprinkle crust with sugar. Place pie on a cookie sheet in case of bubbling over. Bake for about 50 minutes. Remove from the oven and place on a rack to cool. Share the love, not the hype! It’s Clinton cards over here! Great pie! Clinton cards? What the hell? Doesn’t sound like it’s in keeping with the holiday. Try the pie. I think you’ll like it.